Launched in 2010, the Flyer Gran Turismo range is growing. Beneteau are offering 2 new versions of the 49, which are more spacious and luxurious, even more sleek and thrusting, fitted with more powerful and high performance engines and completely rethought with a new interior design. 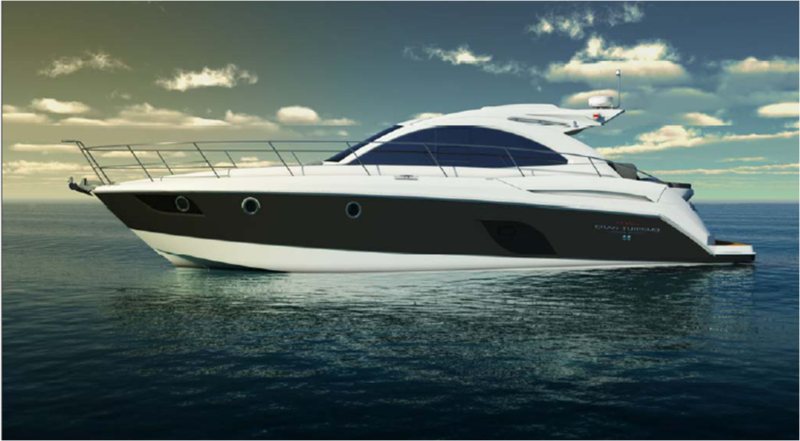 More than ever the Flyer Gran Turismo 49 and 49 Fly can be defined in terms of power and sportiness as well as enjoyment and safety. With such boats you don’t go unnoticed… and you’ll love that! With the unique design of these Express Cruisers, the Flyer Gran Turismo and 49 Fly blend to perfection the pleasures of navigation, lively and sporty as a racing car, and sharing unique moments with friends and family in an atmosphere that is both luxurious and terribly glamorous! The Flyer Gran Turismo 49 and 49 Fly grabs the eye at first glance. With their very feminine curved and determined lines, it does not take much imagination to appreciate the pleasure and the power awaiting to be unleashed. 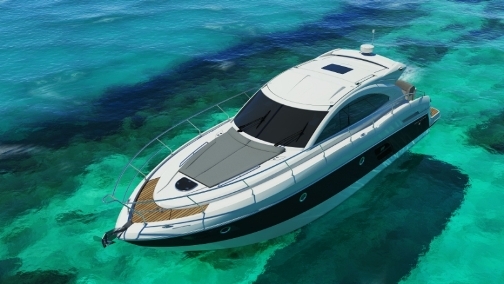 Following the Flyer Gran Turismo 34 and 38 that came out in 2010, they are establishing themselves as innovative and seductive luxury boats. You will find outstandingly enhanced and optimised living spaces, a standard of equipment and choice of materials that are difficult to equal, and recognised engine performance thanks to well-proven engines – a slight air of la dolce vita combining pleasure, the art of good living, sporty luxury and so on. In the Hard Top or Flybridge version, the Flyer Gran Turismo 49 and 49 Fly retain a sleek and sporty elegance whilst displaying generous proportions where space never seems to be lacking! Played out on different levels, the living areas follow and intersect without imposing on each other. – towards the “terrace with a sea view” of the flybridge, in the Fly version. Designed as a mezzanine, the wheelhouse is completely enclosed by a wide glazed picture window. It focuses on an elegant saloon and the driving position fitted with the latest navigation technology. Sliding windows, opening roof and glazed picture window bring maximum light to this relaxation and social space. Down below, the high-tech galley, the cabins and, according to the option chosen, a third double cabin or cosy saloon are bathed in natural light. 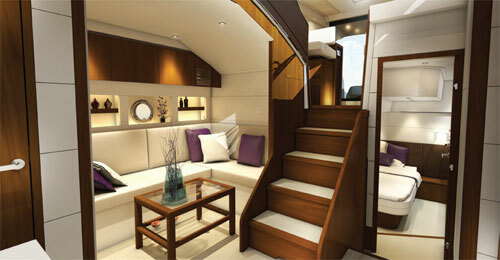 The cabins are vast with King-size berths and each has its own head compartment with separate shower. Fitted with the internationally recognised IPS Volvo propulsion (2 x IPS 600), the Flyer Gran Turismo 49 and 49 Fly display very respectable performance and totally reasonable fuel consumption. 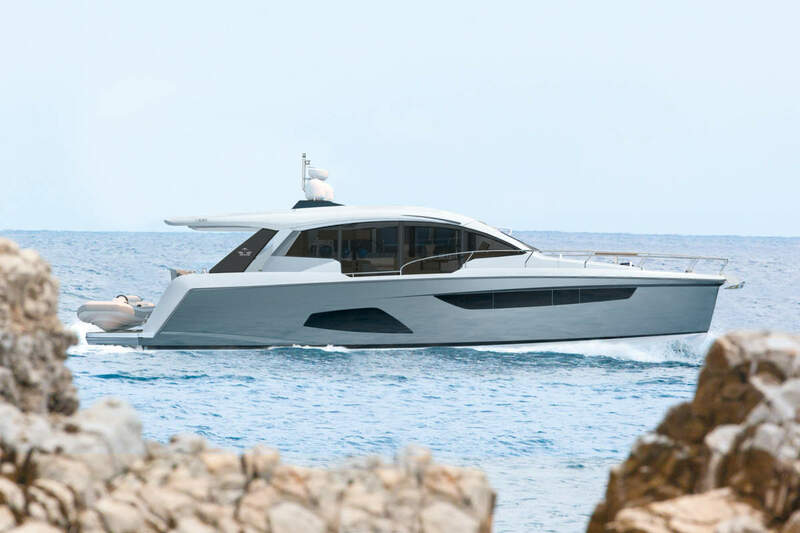 The Bénéteau powerboat hulls bring stability and comfort under way even when the sea has built up. The driving position has all the boat’s controls (these are identical at the second driving position on the Fly version) and more particularly the Joystick to facilitate manoeuvring without stress, with precision, in difficult places, and including in strong cross winds. The “terrace with a sea view” is not reserved for the driver. Accessible via an elegant spiral staircase, the flybridge is a real living room on the water with a long settee around a wide table. The driving position comprises the control panel and two tub seats. Protected by guardrails, the flybridge remains very pleasant under way, even for the passengers, and gives an intense feeling of freedom aided by the 360° panoramic view! With these latest models Bénéteau complete their range of Express Cruisers, and make a name for themselves in the luxury power boat market, an appearance that is notable thanks to accommodation worthy of luxury motor yachts, to a modern, assertive design and to the sea keeping qualities cherished by Bénéteau and recognised on the power boat market.